In the Week 2 edition of fantasy baseball 3×3, we’re scooping up James Paxton, holding on tight to Angel Pagan, and strongly considering new scenery for Billy Hamilton. There are plenty of waiver wire columns out there that provide an exhaustive list of the most added players in fantasy leagues. This isn’t one of them. Here, we’ll run down a few lesser-known, lesser-considered, or lesser-owned players, with perspective on who deserves a your attention, who deserves your patience, and who deserves to go straight to bed without dessert. Any questions, thoughts, beer/food pairing suggestions? Hit me in the comments or on Twitter. Hicks has put a horrifically unlucky (and just generally horrific) 2013 season behind him and come charging out of the gate in 2014. He’s cut his strikeout rate nearly in half and increased his contact rate by more than 10% through his first six games. His BABIP still refuses to move toward the .300-plus levels he routinely posted in the minor leagues, but that will come with time. I loved him going into last season and I still think the Twins overreacted to a poor BABIP when they sent him down after just over 300 plate appearances. Hicks has the ability to post a 15/15 season, and with Oswaldo Arcia out, he’s got a good grip on playing time, at least in the short term. There are deserved question marks with Paxton, but early in the season, I’m cool with having some question marks when the corresponding upside is this high. He hasn’t had a great deal of success in the high minors and his control is eventually (if not soon) going to be a problem, but that stuff, oh, that stuff. It is sooooo filthy. It’ll be a while before Taijuan Walker joins the rotation, but with Paxton, the future is already now in Seattle. Much like my thoughts on Paxton above, my opinion on Cosart is focused much more on potential than results. He’s added nearly a full mile-per-hour to his fastball this season, pumping his heater up above 95 mph on average. He’s never posted great strikeout rates, but in his first start, nearly 70% of batted balls stayed on the ground. Even more importantly, more than half of his offerings found the strike zone. If he can maintain that level of control, he’ll be a solid, if slightly limited, fantasy contributor. The way that owning Hamilton influences roster construction makes him an especially difficult player to trade. If you drafted him, you probably didn’t draft much other speed, because if you drafted him, you were confident that he would swipe at least 50-60 bags. Trading him would almost certainly put you in a prickly situation, but given what you probably had to invest to get him, now might be the best time to get something of value for your investment. Because so far, it does not look like Hamilton can hit big league pitching. He hit a little bit in his limited time last season, but the big leagues in September aren’t exactly the same as the big leagues in April. The same forces that granted Hamilton a call-up brought up more than a few pitchers with questionable MLB credentials. Now, Hamilton is facing a crop of pitchers who just spent a month scratching and clawing their way onto the roster. He faces pitchers who know exactly who he is and exactly what he’s capable of. They know he’s not a threat to take them deep, so Hamilton doesn’t see the steady diet of breaking balls that greet most rookies; pitchers are challenging him with fastballs. And he’s striking out 46% of the time. It’s almost definitely too early to make any grand proclamations about Hamilton’s ability (or lack thereof) to hit big league pitching, but if you own Hamilton and decide to wait until all the numbers stabilize, you’re screwed if it turns out he can’t hit in the majors. If he can’t get himself on base, he’s worthless. Worthless isn’t very good when it could have been Desmond Jennings, Jason Heyward, or Austin Jackson, all of whom were drafted behind Hamilton, according to Mock Draft Central’s ADP rankings. So, at least explore your options for a trade. You’ve probably got a willing partner already, just look back at who missed him by $1 in the auction or complained about him going a round too early in the draft. 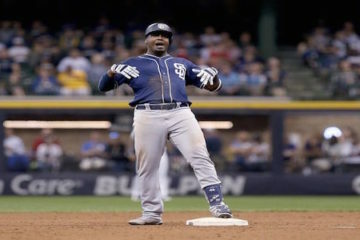 I’d trade/drop him for: Heyward, Jennings, Jackson. It’s two years in a row now that Moustakas has followed up a sizzling Spring with an early season faceplant. He’s reached base just once in 17 plate appearances and continues to hit just about everything in the air. I hoped that Moustakas could turn himself into a poor-average, great-power hitter in the mold of Chris Carter, Brandon Moss, or Pedro Alvarez, but that hope was contingent on Moustakas actually having plus power. His minor league track record seemed to indicate that he had it, but it hasn’t translated to homers at the big league level. Home runs, however, aren’t a perfect quantification of power. Fly ball distance is also imperfect but it’s another pretty good shorthand for measuring a hitter’s raw power. In 2013, Mike Moustakas ranked 231st in baseball in average fly ball distance, four spots behind Jayson Nix. In 2012, he ranked 162nd, three spots behind Norichika Aoki. Compare that to Alvarez, who for all of his struggles to make contact, ranked third in fly ball distance in 2013 and sixth in 2012. Or even compare it to Moss, who ranked 30th and 43rd, respectively. That’s plus power, and Moustakas doesn’t have it. Check out his spray chart from the beginning of 2013 through now; he’s hit some home runs, but it’s not as though he’s sending outfielders to the warning track all that often. There are better options out there at third base, especially knowing that continued poor performance might land Moustakas in a platoon with Danny Valencia, slashing at least 150 plate appearances off his projection this season. Since his dream season in 2010, Jimenez’ fastball velocity has dropped by a whopping six miles per hour. Based on this season’s velocity numbers, that’s the difference between Gerrit Cole and Bartolo Colon. But it’s not just the fastball velocity that worries me, it’s what he’s doing with it. Starting with the second half of last season, Jimenez has moved away from the worm-burning ways that served him well in Colorado and Cleveland. The 41.3% ground ball rate he posted in then is worse than any mark he’d registered in a full major league season, save for 2012, when he flailed his way to a disastrous 5.40 ERA for the Indians. Jimenez has proven that he can still deliver strikeouts without his ten-ton sinker, but I can’t imagine that a style that generates more fly balls will play well to a schedule that will likely place more than two thirds of his appearances in hitter’s parks in Baltimore, New York, Boston, and Toronto. I know outfield is deep, but Pagan really doesn’t get the respect he deserves. Yes, he’s had some injury issues, but in the two seasons in which he’s played at least 150 games, he’s averaged about nine homers, 35 steals, and a .289 batting average. I can’t guarantee that he won’t tug a hamstring or roll an ankle, but he’s healthy now and setting the table for a pretty good offense in San Francisco. Pagan has excellent speed and is one of the elite contact hitters in baseball, but don’t go comparing him to Juan Pierre. His approach is actually very similar to another switch hitter, Victor Martinez. Both are exceptionally difficult to strike out because they combine an excellent feel for the strike zone with elite hand-eye coordination. They know they can put just about any pitch in play, but they’re patient enough to wait for something they can drive. I love Pagan’s talent and I love his approach, hang on through this hot streak. It said a lot about Brad Miller that when the Seattle Mariners signed Robinson Cano, the first question was “where/when will Nick Franklin get traded”, rather than “who’s going to play shortstop for the Mariners?” The organization clearly has a ton of confidence in Miller, and so far this season, he’s doing his part to earn it. Miller has come out with an aggressive approach at the plate and delivered power beyond what you’d expect from his 185-pound frame. Of his seven hits this season, four have gone for extra bases. I believe Miller will be a fringe top ten shortstop the rest of the way, but I do feel compelled to offer a word of caution on his power production. Baseball Heat Maps has a stat that predicts home run production based on fly ball distance; it’s a cool way to get an idea of whether or not a player deserved all of the homers he hit. It’s a bit early to consider that sort of thing, but it’s worth pointing out that Miller has an xHR of just .25 against a homer total of two. No player in baseball has a bigger gap. I still wouldn’t advocate trading him, but be realistic about his production. 15 homers is reachable, but much beyond that is wishful thinking. Somehow, I think I’ve written about Bonifacio more frequently than any other player. I’m not sure where I should be proud, ashamed, confused, or all three. Anyway, as complex as my fantasy relationship with him has been, Bonifacio is a very simple player. He has one outstanding skill: speed. He’s not very good at anything else; his goal is really just to not be so terrible at hitting and defense that the value of his speed is overruled. That’s eventually going to happen. Bonifacio is not a good hitter and although he’s able to play several positions, he’s a horrid defender at all of them. The Cubs are looking ahead to a future that almost certainly doesn’t include him; players in his position can often hope to gain playing time as part of a trade audition, but I can’t imagine that the rest of the league needs to see much more of Bonifacio to know what he’s capable of. So, that leaves fantasy owners in the same boat as the Cubs. Play him while he’s hot, drop him at the first sign of trouble. In my deep keeper league Reddick is my 4th OF and really struggling. I have a feeling Angel Pagan is the way to go. Is it time to let Reddick go and go Pagan from here on out? Kinda depends on what you need. Reddick has a lot more power than Pagan, but if you can live without the homers, then that’s a switch I’d make. Damn, Joe, that’s a real nice staff. I’d rather have Ellsbury than Gomez, but I’m not sure that’d be enough to make me part with Darvish. If you haven’t already, I’d try to see if somebody like Teheran could get that deal done. In principle though, I agree with trading from your strength in pitching; I’d just try to avoid dealing your best guy. Also keep in mind that if you’re in a standard Yahoo! 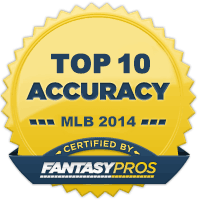 roto league, there’s probably and innings limit, so more pitchers isn’t necessarily better. 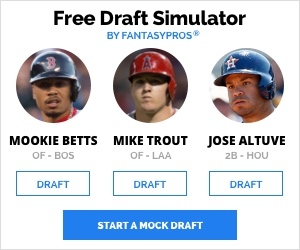 Oh, also, Alan’s Tools of the Trade article (http://thefantasyfix.com/2014/04/2014-fantasy-baseball-week-2-tools-of-the-trade/) is a great resource for questions like this.